I was finally able to spend some MKP! Friday we formed up a raid and headed into SSC with the plan of killing Hydross and heading to lurker for a progression kill. Our raid got started about an hour or so late due to lack of healers being online which was kind of a bummer, but after waiting a while we finally got everyone on and rolling. We had a little bit of trouble on the trash because the big bog guys were dying in unexpected ways that we had never encountered before ( I’ll be much quicker to jump out of the huge green pool of boiling acid next time), but it wasn’t long till we had cleared to Hydross. Most of our attempts on him looked pretty good on dps and healing we just had some bum luck with honors internet connection. Honors is one of the tanks on Hydross so when he loses connection that’s an attempt breaker. I know the feeling when your internet is messing up and there is nothing you can do about it, that’s a one way ticket to frustration hell. I felt bad for honors because I know it was driving him crazy. After a few attempts his connection held out and we downed Hydross. Hydross dropped a tanking trinket which I actually won the roll for (I was rolling against the guy who beat me out for the Mag t4 chest piece and had capped out his DKP again. If he had beat me in the roll I may have gone psycho, flew up to Canada, and then broke all his fingers so he couldn’t play WOW for a while. True story, I just might have. ), but since I had a good roll I’m now I’m the proud owner of a new defense trinket. In all actuality the trinket isn’t an “amazing” piece, I think I’m more happy with the fact I get to use it as a “trophy” that I have seen Hydross down and able to get an item from SSC by using my MKP. After the Hydross kill the raid was called instead of going to Lurker, it was pretty late and I don’t think we had enough guys online to replace all the people that left so I guess that even though it’s a bummer we didn’t get to kill lurker there was nothing we could do about it. 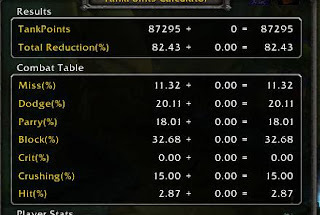 I hope tonight we will maybe be going to Gruul’s or Mag, let’s hope everyone brings their “A” game and we can down both bosses in a low number of wipes. I’m trying to figure out if this trinket will become a permanent part of my set or a situational piece. Defense - Increases the chance of being missed by an attack. - Increases the chance to dodge, parry, and block. - Decreases the chance of being affected by a critical hit. - Decreases the chance of being affected by a "crushing blow". Creatures that are higher level than your character can land crushing blows that deal increased melee damage. The chance of a crushing blow increases as the level difference between you and the opposing creature increases. Players never deal "crushing blows", only creatures. Looking at my character standing still (not using shield block) this is how I look on dodge, parry and block. Here is me using the trinket and shield block. I include the picture of using shield block because while I tank it’s the skill that I let take precedence over everything else. I should never have this skill “not on cool down” so most of the time I’m tanking I have a shield block up so this is a more realistic view of my combat table while I’m tanking something. You can see here that with shield block up my block value is now 42.27% which isn’t too bad. I think I’m going to try using this trinket over my auto blocker as a “save me” trinket and see how it works out. I had been using my auto blocker more as a threat generation piece for shield slam but in the long run my threat has been “alright” that I don’t think I need the auto blocker as a main piece. On a side note about threat: After reading some other tanks on tankspot.com I do feel my TPS is down a tad from what it should be so I have been experimenting with different threat generation rotations with still no major difference. My TPS hasn’t been low enough yet that I’m scared about it, but low enough that it’s something I want to improve. 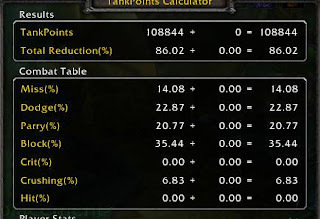 I would like to be sustaining 800 TPS easily like some of the other tanks have posted, but the auto blocker trinket really isn’t helping me with threat a huge amount which is why I’m going to try to ditch it for now. I know I can get up to 800-1000 TPS but that’s only on spikes and not sustainable through a whole fight, so I still have some work to do in that area. I am starting to wonder how much my ISP connection and lag are having to do with my TPS. I find that my Pocketwatch is better "Save Me" trinket than the Scrab. Where I LOVE the Scrab is in my Offtank, and Resist sets. Those sets are usually a little low on Defense. 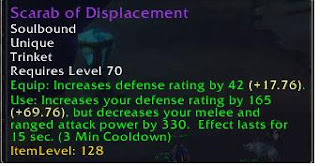 You need some combination of Defense and Resilence to be uncrittable, and for that, I love this trinket. Cool article you got here. I'd like to read a bit more concerning that theme. The only thing it would also be great to see on this blog is some pictures of any gizmos.